I came over from South Africa with a wife and three sons and £3500 to my name. I found a job with LloydsTSB but found that I could not survive on the £18 000 per annum. This resulted in a very slow nibbling on credit cards. I am really puzzled as to how people do survive on renting a property for a family of five. Anyway I then borrowed money to get an investment business of my own going offshore. Everything was going well and I was finally going to make a very good living and pay back all debts. This was mid 2008. After spending money to put together a trip to sell investments the credit crunch suddenly hit and clients cancelled deals which lost me approx £25000 in income. From there things like penalties, interest on penalties, bounced debit order costs, overdraft fees etc just mounted up in a very short time. I looked at the alternative like IVA which I felt was a rip off. All the companies want you to pay off your debts with "frozen interest". The catch is that they charge a whacking £2500 or more which is then added to the debt. Where is the sense of that, (plus spend 5 years of your life paying off the debt) and your credit rating ranks the same as with bankruptcy so makes no sense except for the people selling these plans!! Companies were also wanting huge fees to write letters to Creditors and sort out my bankruptcy. I then went to the court myself and received a form for a nominal fee to complete. This took me about 30 minutes to fill in properly. I then took it back to the court, joined the queue with others and handed the form in at the office (well marked). There is a service called Debt Relief Order which I never see mentioned. Probably because it only costs £99 to go bankrupt and start again. This is a great way to go if a person is embarrassed. Everything is done over the phone. The papers are then posted to you for signature and that is that. It is all over. The only restriction is that debts must not be more than £15000. I then received a telephone call from a clerk who just checked all the facts and a few days later got a letter to say I was bankrupt. Very friendly and thoughtful staff. 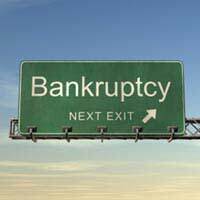 Six months later I received a letter to say that I was now out of bankruptcy because they saw no reason to continue. I then received a letter to say that I was now fully Discharged. Apparently this is becoming the norm if there are no assets. Being once bankrupt has only affected me because I cannot work in financial services which I don't want to do anyway! I did try for the pub industry and they wanted info on my bankruptcy which was disappointing. This is not a problem as I opened an account with the Co-operative bank which came with a visa debit card which I can use anywhere internationally. They accept debit orders, stop orders, Internet banking and salary. The greatest bank ever. The most helpful people I have ever dealt with since being in the UK. I cannot see any problem because nobody else even cares or asked if I ever was bankrupt. The relief has been worth £1million and my stress levels have dropped dramatically. I feel like a new person 20 years younger. Please recommend all worried people to do it save a marriage and live longer. Any money I earn now is mine! Many thanks to Karl for sharing his experiences with our readers. If you have a story that you could share that will help or inspire people in a similar situation to one that you have experienced then please Contact Us. We can change names etc. to keep you anonymous.